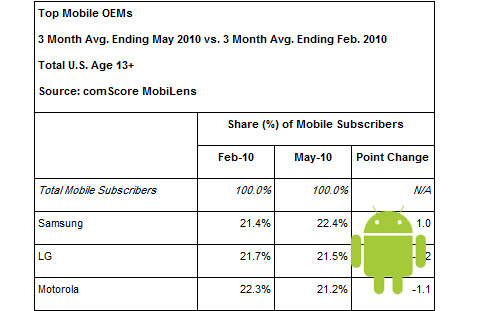 ComScore’s latest statistics regarding smartphone market share have revealed a major shift towards Android based phones in the March to May quarter. The company released the numbers today and it’s safe to say there’s a party going on at the Google headquarters right now. Though RIM and Apple remain the top 2 companies respectively in the smartphone market, their growth rate in the above mentioned quarter has been way lower than Android. Android showed the most significant growth in market share in May, up 4.0 percentage points to capture 13.0 % of smartphone subscribers. In total, 49.1 million Americans owned smartphones during this quarter and the trend is expected to grow massively with a number of new devices about to hit the market. ComScore also reports that 234 million Americans aged 13 and above use mobile devices and it looks like Android is fast becoming the new fad with consumers bored with BlackBerries and iPhones. The battle between Apple and Google seems to be here to stay as both companies try to one up each other constantly. Apple still enjoys a major edge with the second largest smartphone market share but with the level of growth Android has suddenly shown, it might be time for the iPhone manufacturers to start worrying.